According to Douglas Stokes, Math Interventionist in New Jersey, “It is important to take the time to actually show students the right way to complete assignments if they are to get the full benefits of this resource. At the beginning of the school year, I model the right way to complete a TenMarks Math assignment in a student demo account. I model when to use the hints and videos, and how to use the online scratch paper to work through the problems." Michelle Rudolph, Grade 5 Teacher in Washington, explains, "I would do a couple of assignments as a group from the grade level below so that students can build up their confidence. By selecting the option to assign students the same questions in the same order, you can complete the assignment together with students following along while you are logged into a student demo account. I make a point to model how to use the hints and videos throughout the assignment. Then allow them to work on an assignment from the grade level below on their own. The first day after the assignment, I review the usage reports so that they see what the teachers see and understand the importance of taking their time and using hints and videos when they need support." Providing students time to explore in groups allows them to become familiar with features before working individually on assignments. Crystal Dozier, Grade 3 Teacher in Ohio, explains how she will set up her classroom to get her students started on TenMarks Math. "I'm going to set up centers around my room with demo accounts," says Crystal. "Each center will guide small group of students to explore one of the following: assignments, Jam Sessions, the TenMarket, and Amplifiers. Following center time, I will model each activity and encourage students to share things they learned about these activities while working during the center. I will also point out any features that they may have missed. This will culminate with students logging into their individual accounts and completing their first class assignment." 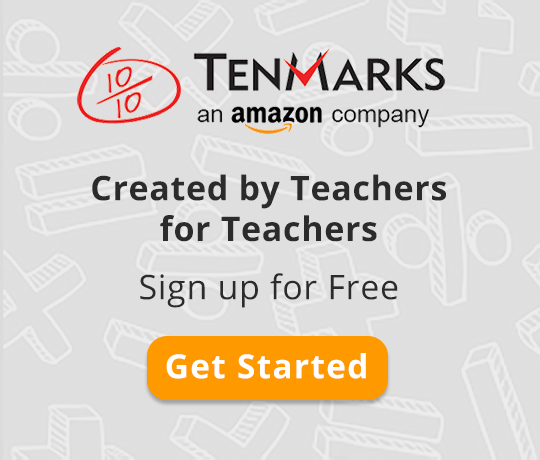 Call out embedded supports and unique features in TenMarks Math in a fun and engaging way! "I am planning to implement a TenMarks Math scavenger hunt this year," says Katie Kayastha, Math Interventionist in Illinois. "Students will be asked to find the helpful resources in TenMarks Math assignments and on the student dashboard. Students will also be charged with figuring out the new features in the product, like Jam Session badges or accessorized monsters, without me telling them." For Scott Newcomb, who teaches grade 4 students in Ohio, adding a bit of healthy competition into the mix gets students excited about using TenMarks Math. He explains, "I held contests with Jam Sessions. The students absolutely loved this! I set the timer and allowed the students to pick a math concept. The students then completed as many problems as they could within the allotted time. The students were rewarded based on how many questions they answered correctly within the allotted time." By assigning partners, teachers can enable students to work together to figure out the new tools while also completing math practice. "I use TenMarks Math during partnering activities," says Regina Carroll, Grade 5 Teacher in North Carolina. "Students have their own assignment pulled up on the screen, but they have to help their partner work out problems as well. I distribute paper and students fold the paper into sixths. The first square is where students write the assignment name. For problems 1 to 5, students jot down each question and answer in the next five squares. On the back of the paper, students list the question and answer for the last five problems. Students put their score in the last square. This way, students can review their partner's work and the teacher can see where students are making mistakes."